Searching online for homelessness data turns up a plethora of results. This is good. It shows us that people are interested in the issue and care enough to find out more, however, it can be overwhelming. 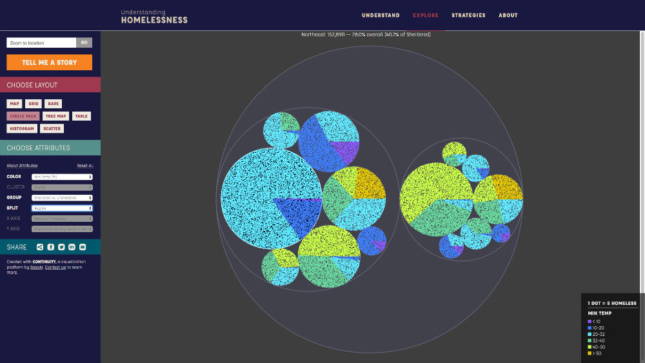 To help, Gretchen Keillor at Boston-based firm Sasaki has made a homelessness analytic tool that compiles more than 30 parameters associated with homelessness in an easy to use, easy to read format. The visualization resource relies on data from January 2015 when volunteers nationwide counted 546,580 homeless people in the United States. It depicts homeless people as dots, coloring them using factors such as average temperature (Fahrenheit), arranging them geographically, or using other graphing methods. Titled “Understanding Homelessness,” its biggest asset is that numerous factors can be used interchangeably, with more than three being applied at one time. For example, an arrangement of circle diagrams compares sheltered and un-sheltered accommodation while subdividing data by region. Further still, inside each circle colored segments display average temperature. Unsurprisingly, this is best explained visually (see below) and the information ultimately tells us that the majority of sheltered homeless facilities can be found in the Northeast where the average temperature is around 20 degrees Fahrenheit. Other interesting factors include GDP per capita, unemployment rate, the amount of rain, the area’s percentage of Obama’s win in 2012, donation contributions, spending on services (such as healthcare and education), average cost of rent, access to beds, and healthcare facilities. These can all be displayed in a readable format. Some statistics correlate and some don’t, but the visualizer makes the data much easier to read. Keillor’s research does more than just visualize data, though. At the top of Understanding Homelessness’ webpage, is a tab called “strategies.” Here viewers can find ways of combating homelessness either through design (two examples include: the Sunday Breakfast Dining in Philadelphia and the Y2Y Shelter in Cambridge, Massachusetts are provided), policy, or program. An example for the latter is an individual contribution from “Haircuts for the Homeless” in London.